Don’t let water and structural damage happen to your chimney. Get a free quote now for your next chimney waterproofing project from Early Times. Water is the biggest and most threatening opponent for masonry chimneys. Moisture in your chimney can lead to a slew of problems including leaks and damaging the structural integrity. That’s why chimney waterproofing is an essential measure for homeowners with chimneys. Early Times is here for all your chimney waterproofing needs. Our experts know exactly what to do in order to keep water out of your chimney. Why Should You Waterproof Your Chimney? One of the most common mistakes homeowners make is not thinking about their chimney until there’s actually a problem. Your chimney is exposed to more severe weather compared to other features of your home because it’s the highest point on your home. Water penetration is the number one cause of deterioration and damage in chimneys. Your chimney must be waterproofed in order to avoid any problems in the future. When Is Chimney Waterproofing Appropriate? The important thing you must understand is that chimney waterproofing is a preventive measure and not intended to be a quick fix for any leaks. If your chimney does have any leaks, damage or deterioration, you need to get that fixed before waterproofing. Waterproofing a damaged chimney won’t solve your problem, but it will help prevent problems from occurring in the future when done correctly. Before you can consider chimney waterproofing, you need to check for any chimney leaks. If you don’t have a cover for your chimney that could easily be the source of any water damage on your chimney. Installing a chase cover would help prevent any future water from entering through the top. If you have a chimney crown, water can be leaking through cracks and deterioration in that. Repairing or replacing your chimney crown will fix that. Cracks in bricks and mortar joints are also a main contributor to chimney leaks. Chimney tuckpointing will fix those joints so they look like they’re new. Getting an overall chimney inspection if you’re unsure about the condition of your chimney is a good measure to take before waterproofing. With all that being said, in order to fully benefit from chimney waterproofing, your chimney must be in solid condition and also cleaned before the waterproofing is applied. Chimney waterproofing is done by applying a sealant along the brick walls of your chimney. The waterproofing sealant absorbs into your chimney to help prevent leaks from occurring. Waterproofing is usually done from the top to bottom so that any excess sealant drips down and almost acts as another layer of chimney waterproofing. 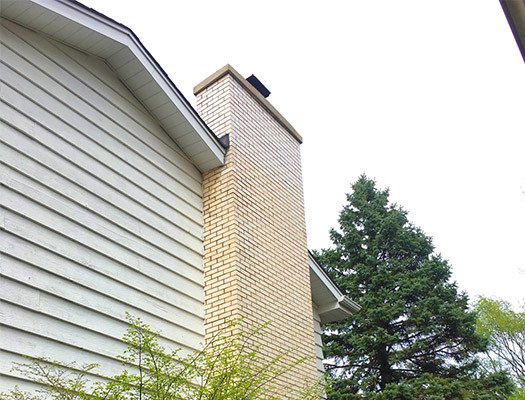 The top of the chimney should receive more coats of waterproofing as it experiences the most exposure to the elements. Flashing and mortar joints also need extra attention when waterproofing a chimney. The joints of your chimney are very susceptible to leaking so it’s important that they receive a generous amount of waterproofing. We’ve been providing the Chicagoland area with the most superior chimney waterproofing for over 30 years. Homeowners trust Early Times for their chimney waterproofing and repair needs. We know exactly what to look for and how to fix all things chimney. Get a free quote today for your chimney waterproofing so you can prevent any damage from happening in the first place.